A section of the proposed Highthorn opencast mine site near Widdrington and Druridge Bay. 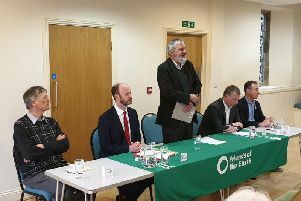 The Government minister who will have the final say on the proposed Highthorn opencast mine is set to make his decision in the next three months. North East-based Banks Mining last year successfully lodged a High Court challenge to the former Secretary of State Sajid Javid’s decision to reject its planning application for a surface mine near Druridge Bay despite a government-appointed inspector recommending that the scheme should go ahead. After the ruling, the project was returned to the desk of Mr Javid’s successor, James Brokenshire, for further consideration and the Secretary of State has now revealed that he will announce his decision no later than Monday, April 22 this year. Mr Brokenshire has also stated that he does not intend to reopen the public inquiry into the Highthorn scheme, which was held in 2017, and that he already has the information required on which to base his decision. Mark Dowdall, environment and community director at The Banks Group, said: “Our Highthorn planning application was approved unanimously by Northumberland County Council’s planning committee way back in 2016, and the uncertainty that has been endured since then by local residents, our highly-skilled workforce, our local suppliers and our business as a whole through a series of unnecessary delays has been extremely challenging for all parties. Lynne Tate, who is part of the Save Druridge campaign group, said: “We’re happy that a firm date has been mentioned by Mr Brokenshire and we’re still very confident that the Secretary of State will decline the application. “With the recent news about climate change, we think he has no choice but to make the same decision as Mr Javid.